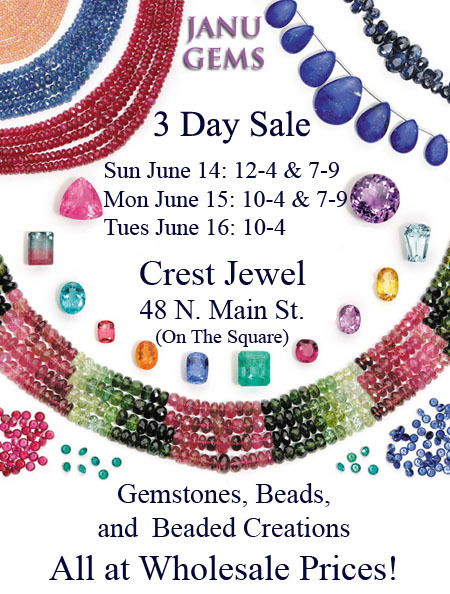 Janu Gems returns to Crest Jewel for a wholesale gem show to fulfill everyone’s desire for bling! At your request Janu will have your Favorite Woven Earrings for $10, also gemstones in every size and color (replace the missing stones in your favorite jewelry pieces), and beads galore from precious rubies and emeralds to semi-precious gemstone beads, some for under $10. Start designing jewelry to wear this summer. We can assist you with help from our experienced beaders and jewelers. We’re on Main St. in the center of the square.